Michele Pouliot has long been associated with Karen Pryor Clicker Training (KPCT), Karen Pryor Academy (KPA), and ClickerExpo as a presenter, curriculum designer and faculty member, and clicker training role model. Michele’s lengthy collaboration with KPCT/KPA has been complemented by her professional accomplishments in her work at Guide Dogs for the Blind (GDB), as well as by her success in the dog-sport world, particularly in canine freestyle. As she continues to be an integral part of the Karen Pryor Clicker Training family, including leading a recent joint venture between Guide Dogs for the Blind and Karen Pryor Academy Certified Training Partners, Michele’s “other life” centers around service dogs—and performance dogs! In her role as Director of Research and Development at GDB, Michele investigates and advances tools that improve GDB’s training programs. A lifelong interest in how dogs (and horses) learn serves her well in that role and has led to a remarkable global reputation and the opportunity to consult for and assess guide-dog schools worldwide. In Michele’s “hobby world,” as she calls it, she finds fun and success in obedience, agility, and most, recently, canine musical freestyle. Canine musical freestyle requires a partnership between human and dog. 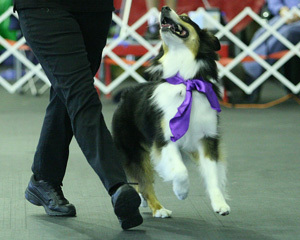 To build creative and show-stopping routines in canine freestyle also requires art (choreography and music) and athleticism (obedience and trick behaviors). Michele’s partners have contributed fully to these requirements and to the relationship. Her canine partners have included English springer spaniel Cabo, young springer spaniel Déjà Vu, and Australian shepherd Listo (pronounced “Lee-stow”). Saké, a young Australian shepherd new to Michele’s household, has not performed yet. In tailoring their performances to the talents and strengths of each individual dog, Michele has been able to add tremendous personality to each dance and receive the highest-level recognition for both artistic and technical merit. Cabo, Michele’s first canine freestyle partner, retired from competition in 2009 due to hearing problems; he passed away in 2012. Déjà Vu is relatively new to canine musical freestyle, but has already performed with impressive results. Michele’s partner in most of her canine freestyle competitions to date has been Listo, whose name means “I’m ready” in Spanish. Raised by Michele since puppyhood in 2003, Listo’s competition life began in 2006. An “unbelievable athlete” with a special love of high jumping, according to Michele, Listo partnered with Michele to win multiple national and international freestyle competitions, including the World Canine Freestyle Organization (WCFO) World Championship in 2009 and the National Championship in 2013. Michele and Listo made WCFO history as the first team to receive "Perfect 10s" for both Artistic and Technical scores in the Championship division (called Perfect Dance Partners) of WCFO. They repeated this incredible achievement of receiving "Perfect 10s" a total of 24 times. Among the 24 awards for "Perfect 10s", 12 different routines were represented. After retiring from 7 years of competition in 2013, Listo passed away recently, at almost 11 years of age. 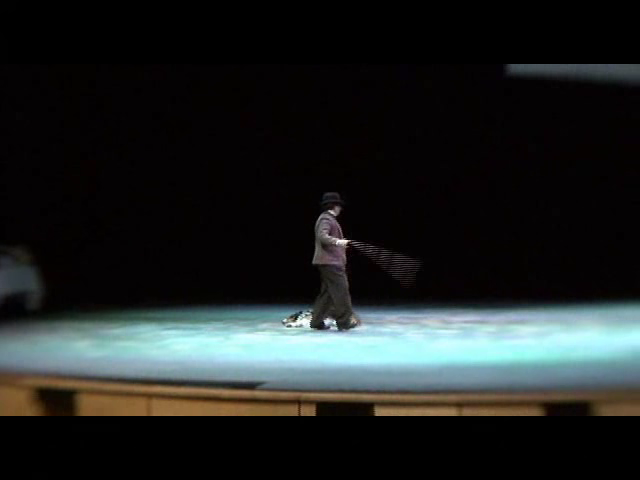 There are so many amazing performances with Listo that Michele has to look back on to remember that day, that dance, that connection, that dog. There are so many amazing performances with Listo that Michele has to look back on to remember that day, that dance, that connection, that dog. Listo and Michele performed together for the last time on June 7, 2014, in Corvallis, Oregon. That tribute performance contained elements of more than 10 routines that Listo and Michele performed together. Deana Allen, Community Field Representative at Guide Dogs for the Blind, has been around Michele and Listo since the beginning of their career. She says, “Something she [Michele] is so happy she did with him [Listo] before he passed away was to perform a tribute to and with him at a freestyle event in Corvallis, Oregon (the starting point of it all). They revisited some of the highlights of all the routines they have performed over the years. At the end of the event, all the people who have been there since the beginning, and some awestruck newbies and more recent additions, had the fun of playing in the ring with Listo. It was a touching way to cap an illustrious career. After Listo’s death, Deana spent some time with Michele talking about Listo. They talked about the fun Listo had in June performing some of his favorite behaviors once again. We agree with Deana that Michele and Listo “were truly the dream team.” Everyone at Karen Pryor Clicker Training extends sympathy to Michele, and to the canine music freestyle world, on the loss of Listo, an incredible canine performer and friend.